Key Largo's Port Largo airport ( KYL ), which closed in 1985, has largely been forgotten by all but longtime local residents, pilots, and aviation buffs. The airport, dredged from the ocean floor, was little more than a breakwater with a runway on top and operated for little more than a decade. Despite its diminutive size, Port Largo enjoyed commercial commuter airline service and became the center of a nearly two decade legal battle. The story of this unusual airport began in the late 1960s with an undeveloped, submerged parcel of land owned by the State of Florida on the Atlantic side of Key Largo. The State sold the parcel to a developer who dredged the area and constructed a breakwater that was paved with a 2,300 foot landing strip. It was agreed that the developer would eventually donate the property to Monroe County for use as a public airport. Dredging began in 1968 and the airport was opened in 1972. 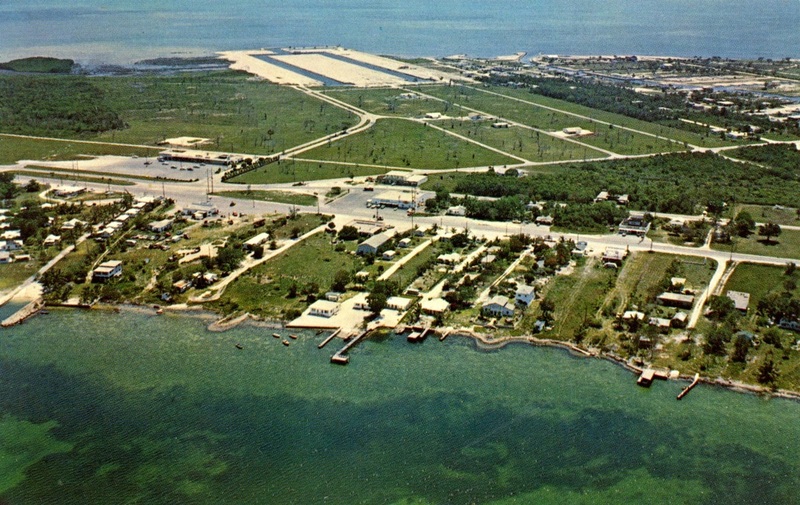 Below: This late '50s / early '60s aerial postcard view of Key Largo around mile marker 99.5 shows the initial phase of the Port Largo development at the top of the photo. The area shown under construction was for private residences. The area that became the airport, just beyond the shore at top left, was still underwater at this point. Thanks to Jerry Wilkinson at keyshistory.org for this photo! This aerial photo was taken on February 10, 1971 while the airport was still under construction with the runway graded but not yet paved. A single aircraft can be seen at top left. Port Largo Airport is seen at the center of this February 1976 Miami sectional chart and is shown as having a single 2,300' paved northeast/southwest runway. Prevailing winds in the Keys are quite often from the southeast, perpendicular to the runway at KYL. Paul Lucas wrote in 2013 with this info: "I used to fly into this airstrip in an Aztec, always seemed to have a crosswind when flying in or taking off. This would have been in the mid 70's." Commercial airline service came to Port Largo in 1976 when Commutaire International Airways operated flights between Port Largo airport and Miami using 9-passenger Britten-Norman Islanders. Timetable courtesy of Craig Morris via Timetable Images. Bahamas Caribbean Airlines operated scheduled passenger flights between Port Largo, Miami and Homestead in the early 1980s. This timetable is dated June 26, 1981. The airline changed its name to Aero International a short time later. BN-2 Islander N901GD of Aero International was one of several aircraft flown on scheduled airline flights to and from Port Largo in the early 1980s. (This photo is not at Port Largo.) Photo courtesy of Allan Wright at the BN Historians website. Thanks Allan! Fred Brooks sent the following photo of the view down runway 19 at Port Largo Airport from the 1970s. He writes, "The photo was taken by Al Dranetz who owned the Rock Harbor Lodge Chinese restaurant. His daughter-in-law posted this on Facebook." Clayton Peters sent in the following 4 photos. He wrote, "I can date these photos definitively to February 1984, as that is when I earned my Night Diver certification and I was at Key Largo to do the necessary certification dives at Pennekamp. That is about all I can remember about KYL; other than the fact that being an Air Force brat, I thought it was one crazy runway. (NOTE: It actually won my previous personal “crazy airport” rating away from George T. Lewis airport on Cedar Key.)" Thanks Clayton! This combination of two photos, facing south, illustrates just how narrow the airport was. The runway was surrounded by water on three sides. The canal in the foreground connects to the Atlantic at the end of the runway on the right side of this photo. A diving boat returning from Pennekamp coral reef with Port Largo Airport in the background, February 1984. Another shot from Clayton Peters showing the north end of Port Largo Airport in the background, February 1984. Clayton created this collage of the previous two photos to help show the aircraft in the background. This Florida DOT aerial of Port Largo Airport dated April 3, 1985 shows 8 light aircraft parked on the north end of the airport. Hard to tell, but the aircraft closest to the parking lot looks like a BN-2 Islander, the type that was flown commercially into KYL. In the early 1980s, the property was purchased by New Port Largo, Inc, who intended to close the airport and build homes on the site. Upon learning this, Monroe County commenced litigation to block the closure and gain legal control over the airport, and even changed zoning laws in an attempt to block residential development. Monroe County lost the battle in 1985 and the airport was permanently closed. Lawsuits between the two parties continued well into the late 1990s. This aerial photo taken on October 7, 1987 shows the former airport in the early stages of residential redevelopment with the first house under construction on the right. The former runway runs horizontally in the foreground and the aircraft parking was at far right. The small palms placed along the runway marked the property lines for the lots of the new subdivision. From the Wright Langley Collection of the Florida Keys Public Libraries. This shows the demolition of the aircraft ramp on the northern end of the airport. A pile of tires sits near the end of the former runway 19 at far left. From the Wright Langley Collection of the Florida Keys Public Libraries. Another photo taken on October 7, 1987 shows the southern end of the runway with a white X and threshold markings and runway number 1 barely visible. The small palms marked the property lines for the lots of the new subdivision. Here's a wider view of the same photo, with Florida Bay in the distance. The strip of land that was once Port Largo Airport is now a street called Ocean Cay with high-density oceanfront property. Many residents probably have no idea that a commercial airport once operated where their houses now stand. Here's a bird's eye view with a pointer noting the southern end of the former runway. Photo courtesy of Port Largo Properties. This 2011 view from Google Maps shows the old terminal building still in place. The aircraft ramp was to the left of the fence. Just imagine, once upon a time you could walk through this gate and board a flight to Miami! Richard: "Back in 1978 I was a crew member of the Beech Aircraft film crew that landed and used KYL for a movie about our single engine Bonanza airplanes. We were based in and flew from Opa-Locka to Key West, with scenes at Port Largo. The films night shots were at Opa Locka, I was there, and scuba shots were off the Largo marina area. I did not go on that scene. The film was called Bonanza:The Special One. Circa 1979. I have shot a lot of air to air before and knew that my pilot was NOT qualified for formation flying; he was looking all around and not paying attention to the other 3 airplanes. I vividly remember flying over the bay thinking ‘were there sharks in the water I would have to deal with when my pilot bumped into the number 3 aircraft and we both dropped into the water’. So, I did not think a lot about the airport runway length but just getting there very fast. After landing I drove back to Opa Locka in the car the director rented, I was not getting back in the airplane with that pilot. The pilot’s poor flying led to the scenes being edited out of the film because his airplane was going up, down, in and out all over the place, and not solid in formation as expected." 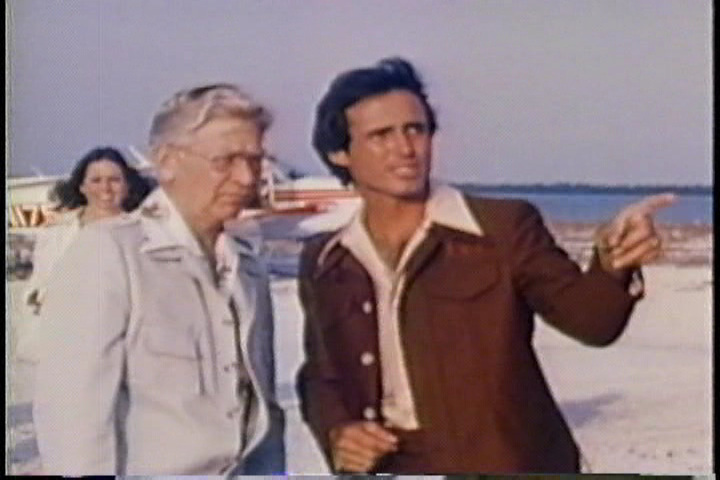 This screenshot from a Beechcraft promotional film called "People Machine" shows a scene filmed at Port Largo airport in 1978. This is facing east towards the Atlantic. Courtesy of Richard Young. 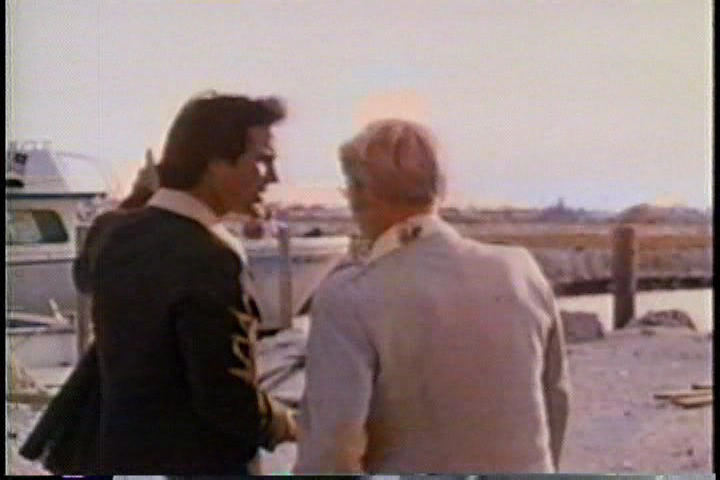 Another shot from the same film, this time facing towards the Port Largo development. Much of the fill for the airport was dredged from the canal bordering the runway. Courtesy of Richard Young. Richard continues his story: "There was a second and much better movie that has scenes from Opa Locka, Miami Beach and Largo, and had Cliff Robertson on camera and a “Silver Screen” award for outstanding creativity. Cliff had a Beech Baron, basically a Bonanza with two engines that he needed to get some work done on, so we ‘comped’ his on-camera work for some parts for his airplane. The one thing I remember with Cliff, after doing the on camera (movie close) shots at Beech West Van Nuys airport, we loaded in a rental and headed to Ventura, CA to do the opening, Cliff said he knew where to go on the beach so he drove. Wow, that was another scary trip because he was very aggressive on the freeways." Thanks to Jerry Wilkinson, Richard Young, and Paul Lucas for their help with this page. It's been incredibly difficult to find photos of KYL when it was in operation! PLEASE contact me if you have any photos of this airport. I'll send you a copy of my book "Sunshine Skies: Historic Commuter Airlines of Florida and Georgia".